coriander rice is an aromatic and spiced rice dish made with fresh coriander, spices and veggies. coriander rice recipe with step by step pics – aromatic and spiced rice made with fresh coriander, spices and veggies. 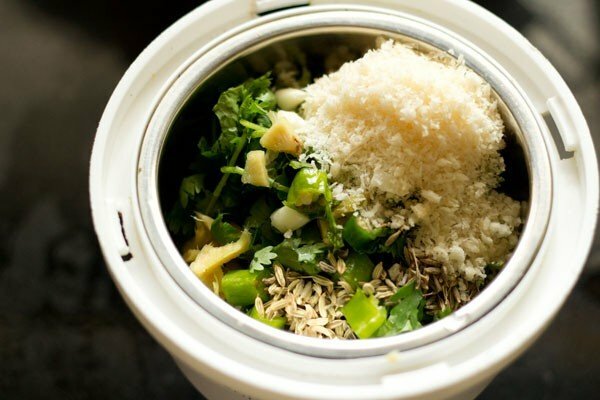 this is an one pot and easy cilantro rice recipe. 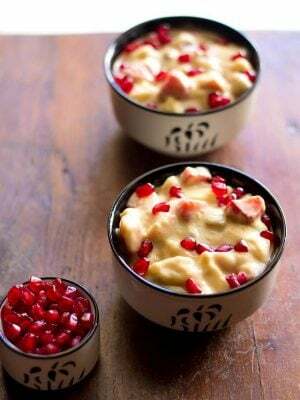 sharing another of those recipes that are a part of my everyday cooking. i make pulaos and rice based dishes often as they are easy to put together and cook quickly in a pressure cooker. i just need to pair a raita or a salad with the pulao. 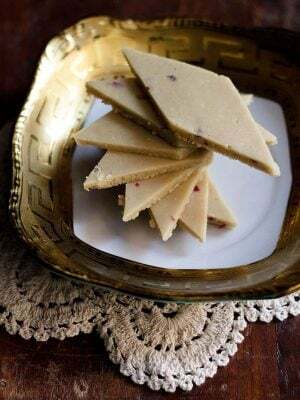 so kind of easy and also rice recipes go well in the tiffin box. this coriander rice recipe can also be made in a thick bottomed pot or pan. i have mentioned the pointers in the notes section of the recipe card below. usually in coriander rice, i also add the spare veggies from the fridge, like one carrot or a couple of beans or a quarter of cauliflower or broccoli. here, i added some potatoes and green peas. though you can add any veggie and even skip if you want. 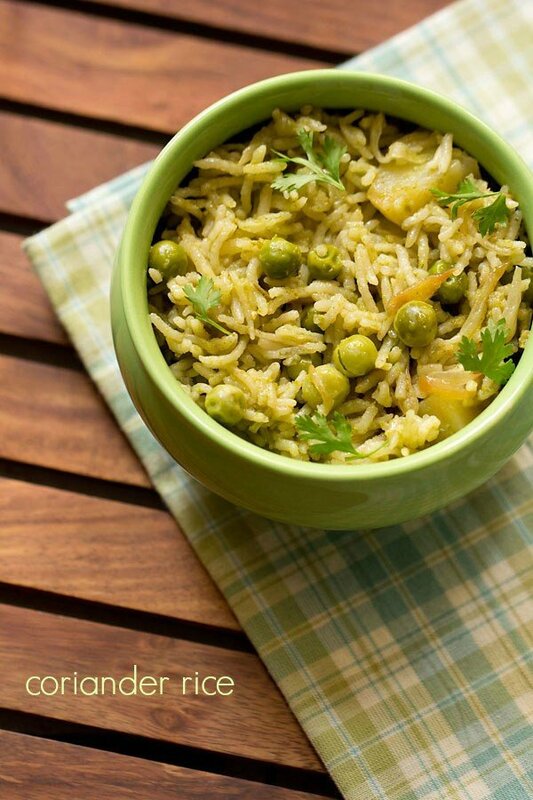 serve coriander rice with a side raita or salad. you can also have a mango pickle or lemon pickle by the side with a few roasted papads. rinse and then soak rice in water for 30 minutes. then drain the water and keep the rice aside. prep the other ingredients when the rice is soaking. 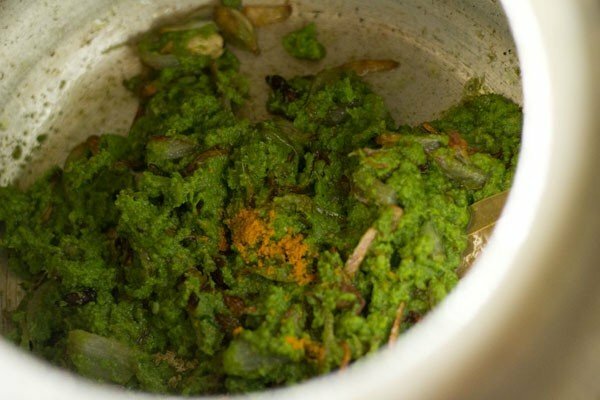 take 1/2 cup chopped coriander leaves (cilantro), 2 to 3 green chilies (chopped), 1/2 inch ginger (chopped), 2 tbsp unsweetened desiccated coconut (or 2 tbsp grated coconut), 3 to 4 medium garlic (chopped), 1/2 tsp cumin seeds (jeera) and 1/2 tsp fennel seeds/saunf in a small grinder or chutney grinder. add 2 to 3 tbsp water and grind to a smooth paste. 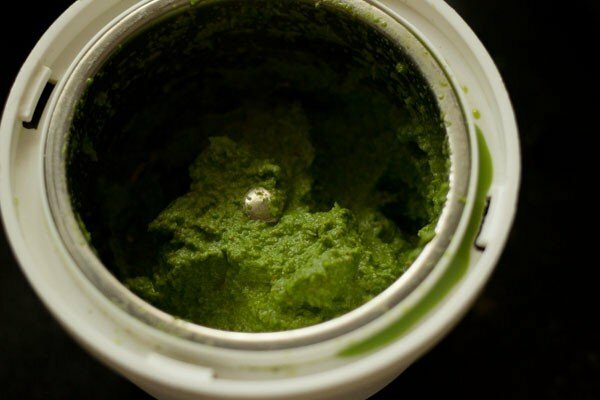 keep this green paste aside. heat 2 tbsp oil in a pressure cooker. 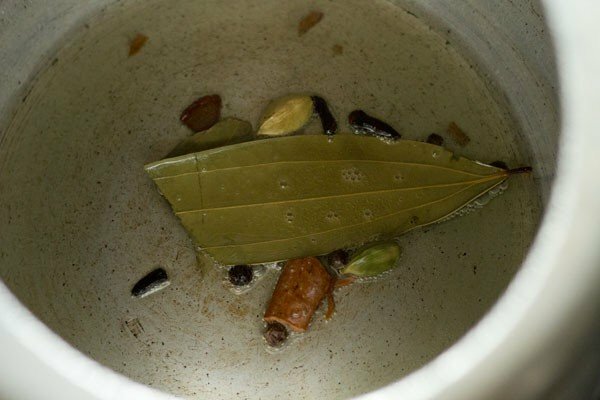 add the following whole spices - 2 to 3 cloves, 4 to 5 black peppers, 1/2 inch cinnamon, 2 green cardamoms and 1 or 2 single strands of mace. saute till the spices become fragrant. takes few seconds. add 1/3 cup thinly sliced onions. on a low to medium flame, stir and saute the onions till they become golden. 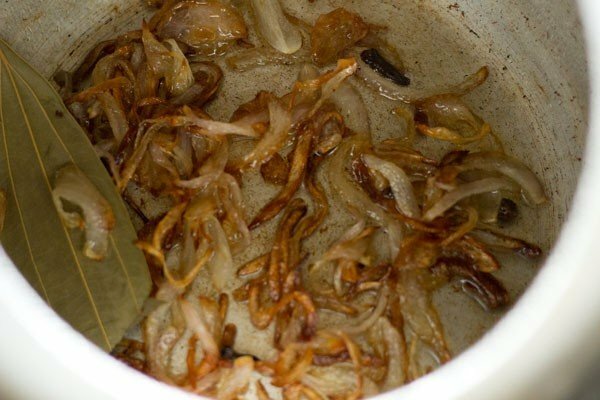 keep on stirring often so that the onions have a uniform golden color and do not get burnt. lower the flame and add the ground coriander-spices paste. add a pinch turmeric powder. stir very well. add chopped 1 medium potato and 1/3 cup green peas. you can use any mix vegetables of your choice or even skip them. stir again. then add the drained rice. stir gently and saute the rice for a minute. add 1.5 cups water and salt. stir again. taste the stock and it should feel a bit salty. cover and pressure cook coriander rice for 2 whistles or for 9 to 10 minutes on a medium to high flame. 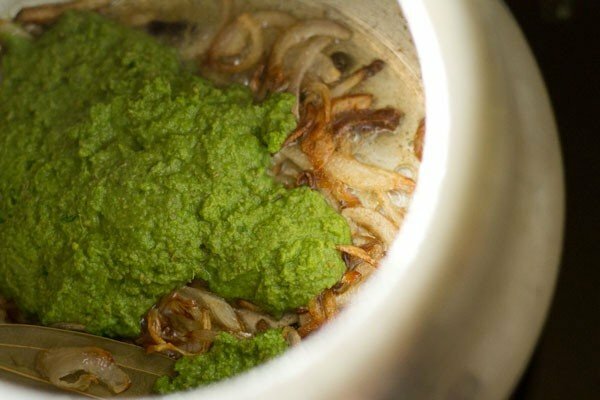 when the pressure settles down on its own, remove the lid and gently fluff the cilantro rice. 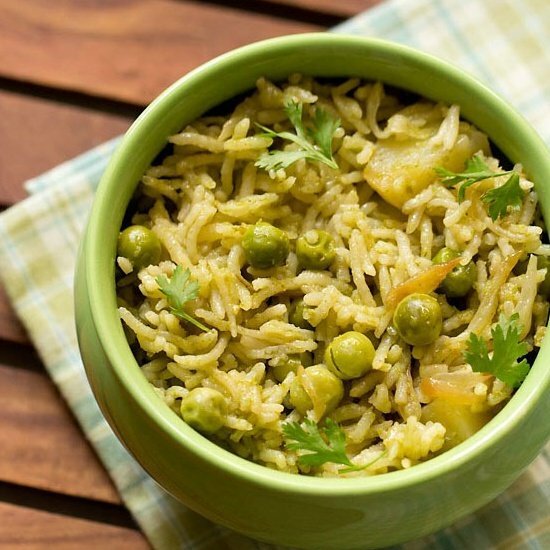 serve coriander rice with a side raita or salad or a pickle. 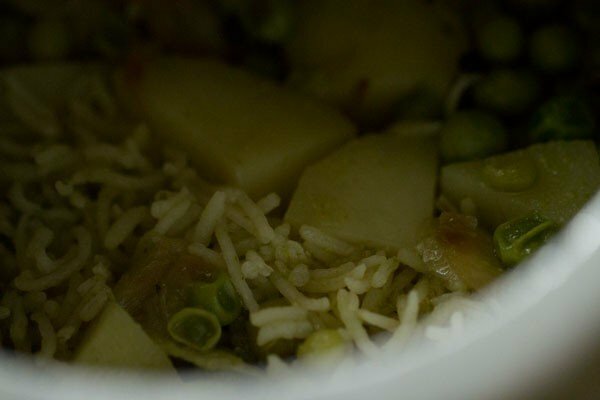 the entire coriander rice recipe can also be made in a pot or pan. add 2 cups of water if cooking in a pot. cover tightly and cook the rice grains till done. do check while the rice is cooking and if required, you can add more water. 1. rinse and then soak rice in water for 30 minutes. then drain the water and keep the rice aside. prep the other ingredients when the rice is soaking. 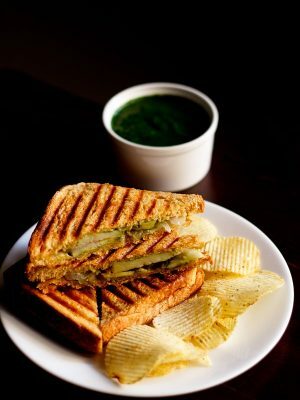 2. take ½ cup chopped coriander leaves (cilantro), 2 to 3 green chilies (chopped), ½ inch ginger (chopped), 2 tbsp unsweetened desiccated coconut or 2 tbsp grated coconut, 3 to 4 medium garlic (chopped), ½ tsp cumin seeds/jeera and ½ tsp fennel seeds/saunf in a small grinder or chutney grinder. 3. add 2 to 3 tbsp water and grind to a smooth paste. keep this green paste aside. 4. heat 2 tbsp oil in a pressure cooker. 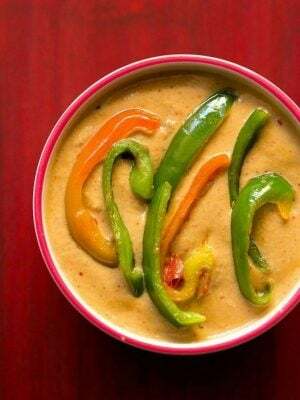 add the following whole spices – 2 to 3 cloves, 4 to 5 black peppers, ½ inch cinnamon, 2 green cardamoms and 1 or 2 single strands of mace. saute till the spices become fragrant. a few seconds. 5. add ⅓ cup thinly sliced onions. 6. on a low to medium flame, stir and saute the onions till they become golden. 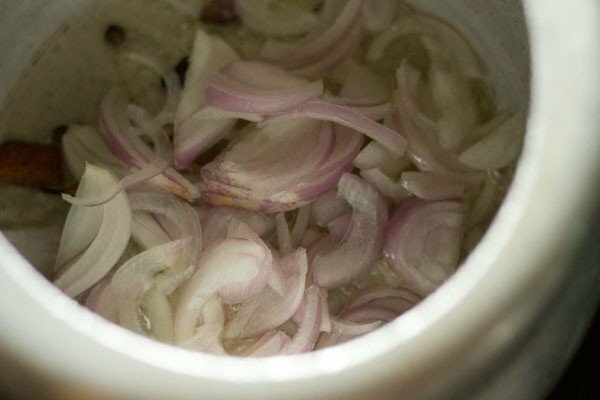 keep on stirring often so that the onions have a uniform golden color and do not get burnt. 7. lower the flame and add the ground coriander-spices paste. 8. add a pinch of turmeric powder. 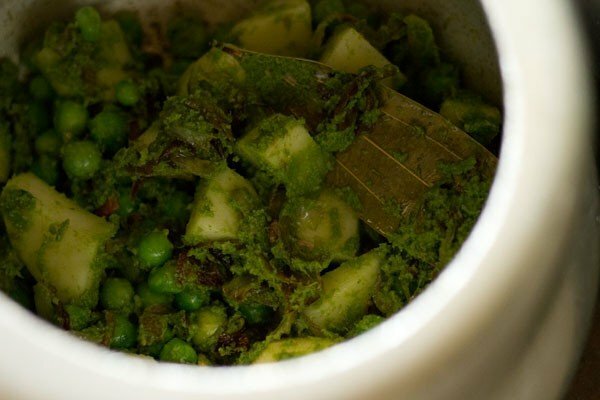 10. add chopped 1 medium potato (chopped) and ⅓ cup green peas. you can use any mix vegetables of your choice or even skip them. stir again. 12. stir gently and saute the rice for a minute. 13. add 1.5 cups water. stir again. 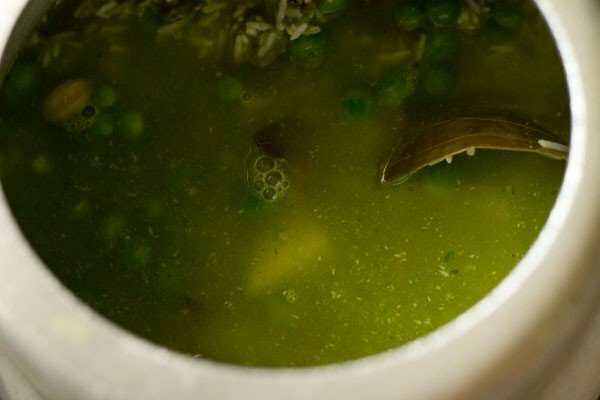 taste the stock and it should feel a bit salty. 14. cover and pressure cook cilantro rice for 2 whistles or for 9 to 10 minutes on a medium to high flame. 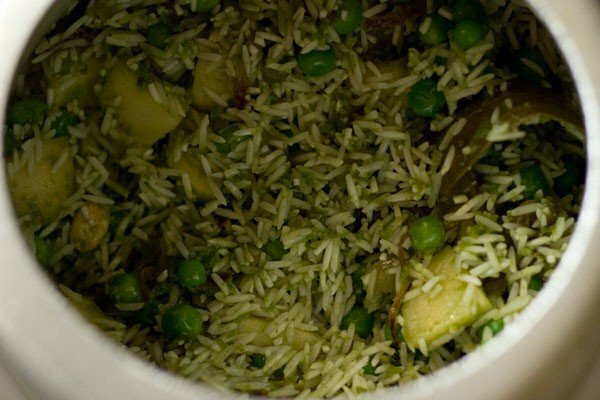 when the pressure settles down on its own, remove the lid and gently fluff the cilantro rice. 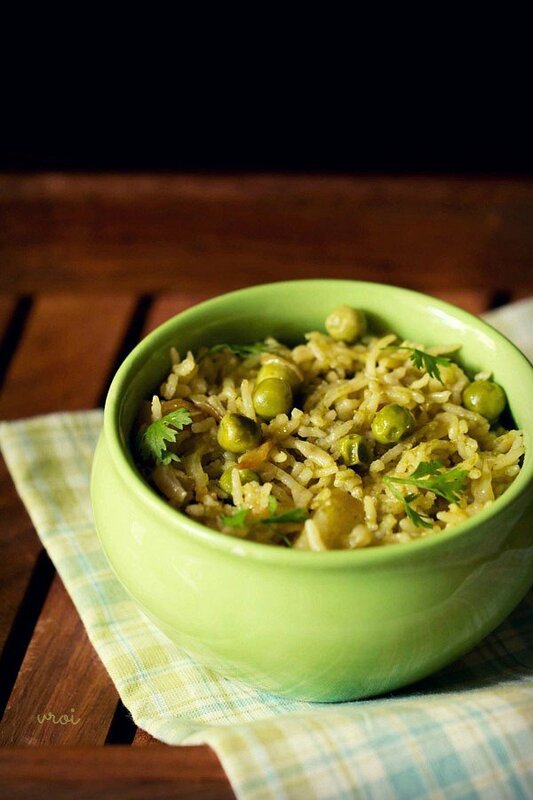 15. serve coriander rice with a side raita or salad or a pickle. 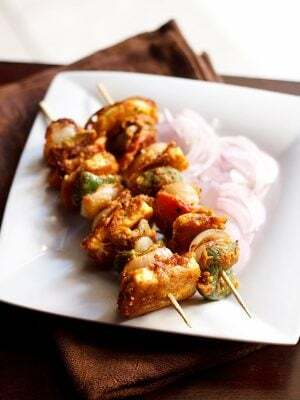 while serving you can garnish with some chopped coriander leaves too. okay. next time you can add less water. 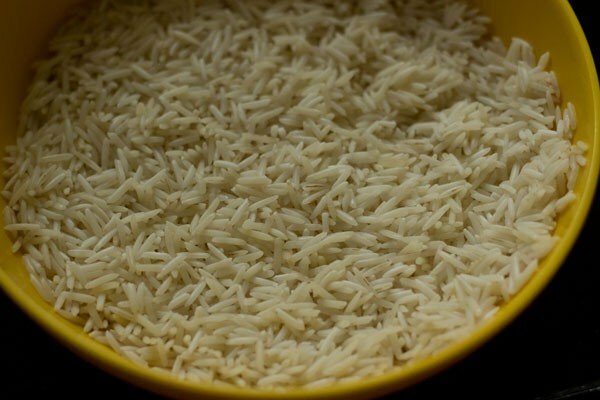 different types and varieties of basmati rice need more or less water. 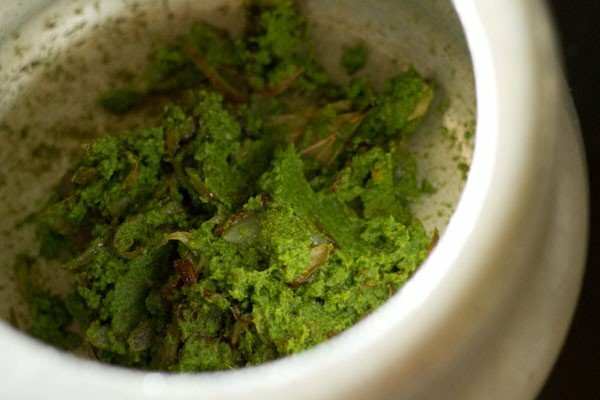 also while grinding the coriander paste add less water and not too much water. 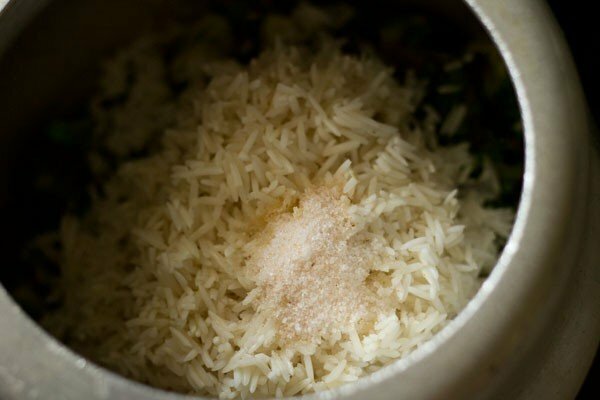 in case you add more water while grinding, then add less water when pressure cooking rice. Just made the coriander rice. 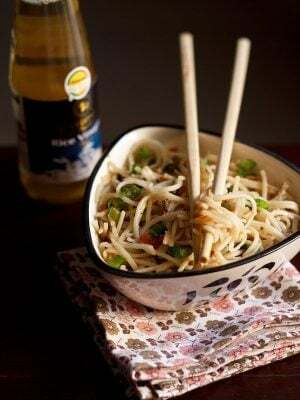 I cooked it in a rice cooker instead of a pressure cooker and the aroma………………..mmmmm, what can I say? It filled the whole kitchen ? I couldn’t wait to open it and try. Turned out real tasty though it wasn’t as green as yours. Maybe I added a tad too much turmeric powder? It was a little spicy too. Kids had to eat it with yogurt. Overall, excellent. Will definitely make it again. 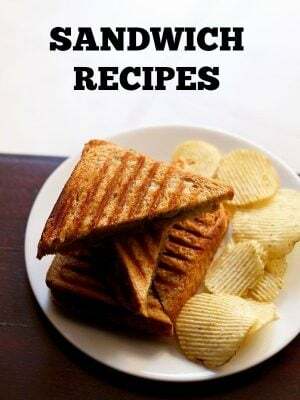 Thanks for all your recipes and the step by step pictorial instructions. Your recipes make me look like a great cook! pleased to know this sita 🙂 thankyou so much for your kind words. alter spice as per your preference you are always welcome and glad we could help you. pleased to know this anoma 🙂 thankyou so much and glad your family liked it. 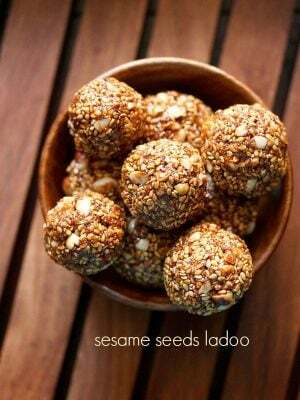 Easy, Simple and very tasty..